Thanks to Paul Rabbitts for providing the following informative and interesting information on the “History of Bandstands in the UK”. Bandstands were once the centerpiece of most parks and a feature of the British way of life for over a century – bringing the open space to life with music and theatre. But after the Second World War a large number had disappeared, scrapped as part of the war effort along with many park railings, but also many fell into disuse and were neglected because they were simply too expensive to maintain. Many were demolished as public parks and seaside resorts went into a spiral of decline in the 1980s and 1990s. At their peak, there were over 1,200 bandstands in Britain, but over the years, numbers have dwindled to less than 500. 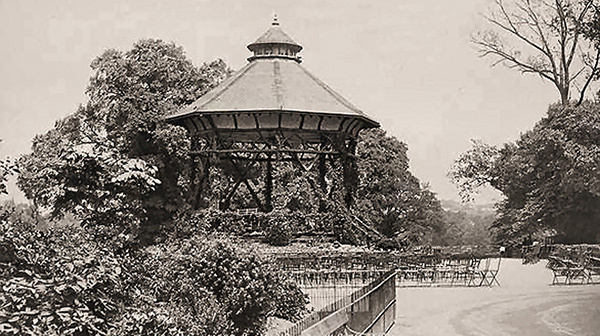 The first domed bandstand, then called a “band house,” was made from iron and erected in the Royal Horticultural Society’s gardens in South Kensington in 1861. Parks were becoming increasingly popular places for workers to spend their time and the open spaces needed a focal point, which bandstands provided, with music to ‘soothe weary urbanites’. The stands, which often had an oriental shape inspired by the expansion of the empire into India, also provided a wide range of music but was primarily populated by brass or military bands, with over 40,000 brass bands in existence towards the end of the nineteenth century. During their heyday in the Victorian era bandstands were hugely popular and regularly drew crowds of up to 10,000. Bandstands soon became so popular that nearly every public park and seaside resort had one by the end of the nineteenth century. But the popularity of bandstand concerts waned in the 1950s as other attractions, such as the cinema, radio and TV became increasingly popular and, as a result many fell into disrepair. Cities like Leeds lost 17 out of 18 of its bandstands, Sheffield lost all but one bandstand, whilst London’s bandstands dropped from 100 to 50 after World War Two. There was a brief revival in the late 60s when groups such as Pink Floyd, The Who and Fleetwood Mac played a series of free bandstand concerts at Parliament Hill in London. David Bowie also played a free concert in 1969 in Beckenham Recreation Ground, Bromley, but between 1979 and 2001, more than half the bandstands in British parks were demolished, vandalised or fell into a chronic state of disuse. But bandstands are back and are once again becoming the focal points of vibrant parks, not just echoing to the sounds of brass, but often bouncing to rhythm and blues, rock, opera, street theatre and drama. 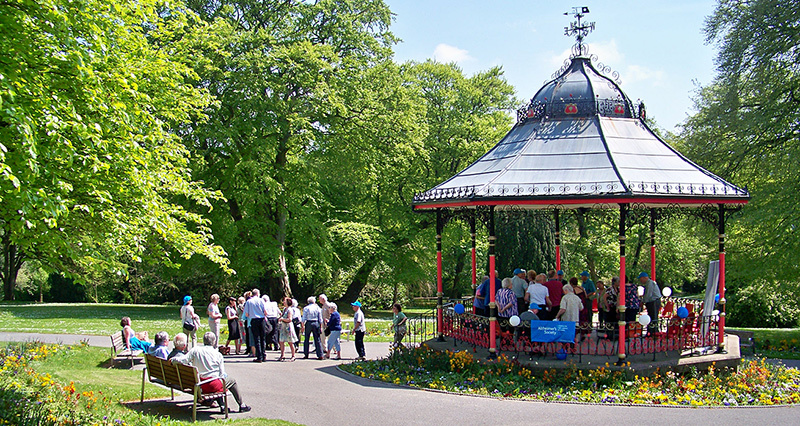 Since 1996, bandstands have been revived in North Lodge Park, Darlington, which became had been dilapidated for 20 years and Handsworth Park in Birmingham, which was virtually derelict until it was restored 2005. The bandstand at West Pier in Brighton was beautifully restored in 2009 after the Victorian structure gradually fell into disrepair, whilst the bandstand at Exhibition Park in Newcastle upon Tyne was given a new lease of life in 2015. In other parks where bandstands have been lost altogether, replicas of the originals have reappeared including Albert Park in Middlesbrough, South Marine Park in South Shields and Alexandra Gardens, Windsor, which was opened by none other than the Queen last year. Restorations are also currently underway in other parks, including Hanley Park in Stoke, Swanage in Dorset and the Pump Room Gardens in Leamington Spa. Paul Rabbitts, Head of Parks for Watford Borough Council and an avid enthusiast, author, campaigner and historian of bandstands, said: “It is brilliant seeing so many bandstands up and running again, bandstands are back and their return is welcome. But local communities also need to wake up and see the opportunities their local bandstands have to offer. Councils and voluntary groups need to promote them more so they can once again come alive with the sound of music. Working with organisations such as Making Music and Brass Bands England, the opportunities for utilising these spaces for music are immense. There is also now a dedicated website to promote the use of bandstands (www.pavilionsformusic.co.uk) – it’s time to ensure we do not lose any more of these wonderful iconic structures.” An excellent way to promote the use of bandstands in your local park is without doubt Make Music Day – which occurs every year on the 21st June and is an annual set of free music events taking place in venues and public spaces across the UK, including bandstands – check out https://makemusicday.co.uk/ It is an ideal way to showcase the potential of your local bandstand. In short, if you don’t use it – you may lose it!